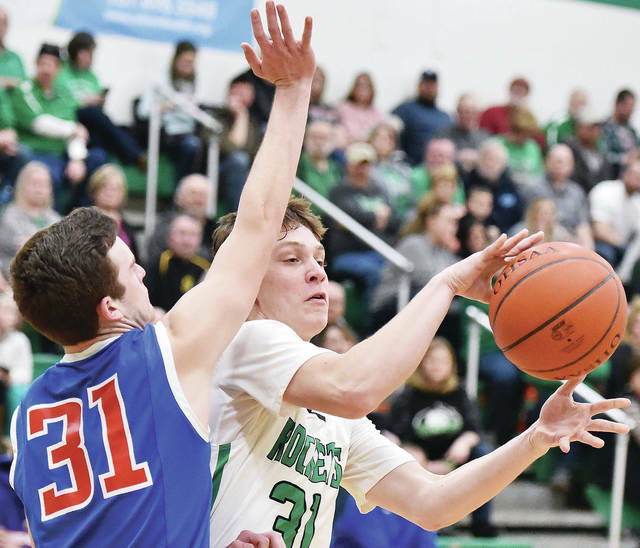 Anna’s Griffin Doseck shoots with pressure from Greeneview’s David Lehotay during a nonconference game on Saturday in Anna. 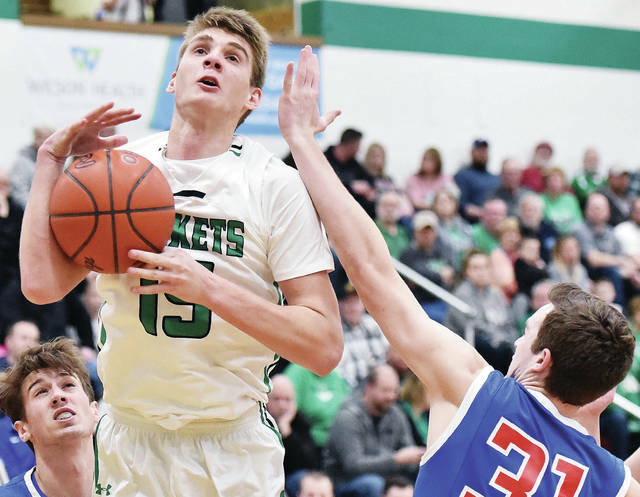 Anna’s Bart Bixler shoots over Greenview’s Ian Tamplin during a nonconference game on Saturday in Anna. Anna's Bart Bixler and Greenview's David Lehotay struggle for ball control at Anna Saturday. Anna's Griffin Doseck shoots against Greenview at Anna Saturday. Anna's Bart Bixler shoots over Greenview's David Lehotay at Anna Saturday. Lehman Catholic’s Emily Fogt shoots during a nonconference game against Bellefontaine on Saturday in Sidney. 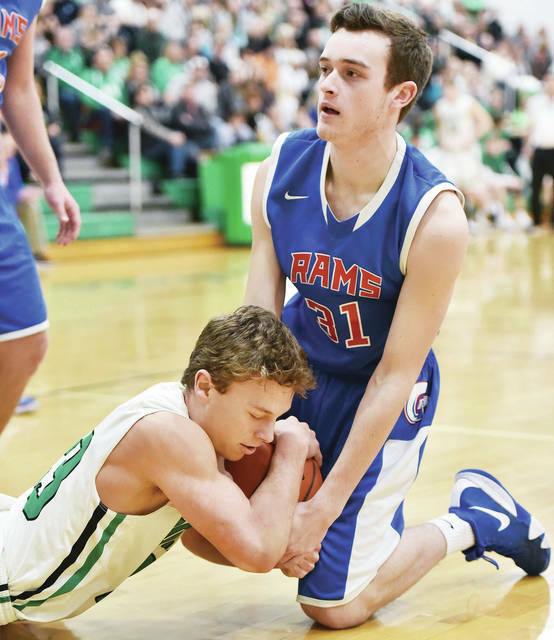 Anna's Kamren Steward is double teamed by Greenview's Jack Nix and Brayden Roseman at Anna Saturday. Anna's Carter Elliott passes as Greenview's David Lehotay at Anna Saturday. Anna's Justin Murray shoots as Greenview's Collin Wilson defends at Anna Saturday. Anna's Kamren Steward shoots as Greenview's Ian Tamplin defends at Anna Saturday. 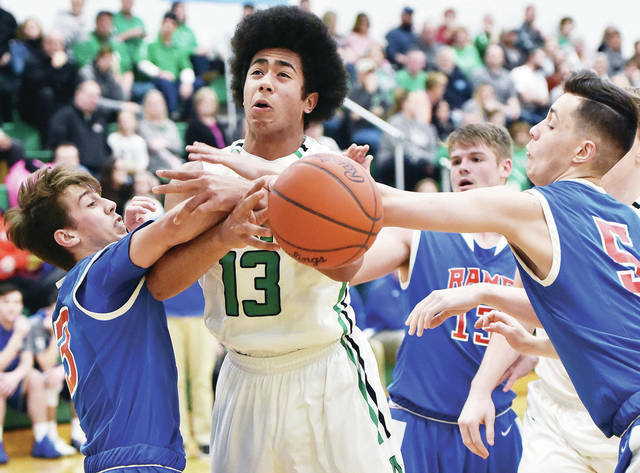 ANNA — Anna dominated from the start and cruised to a 70-50 nonconference win over Jamestown Greeneview on Saturday. The Rockets took a 19-11 lead by the end of the first quarter and built a 37-24 lead by halftime. Anna outscored the Rams 20-11 in the third to push the lead to 57-35. Bart Bixler led Anna with 26 points while Kam Steward scored 14 and Griffin Doseck added 11. The Trojans dominated all the way in a nonconference victory on Saturday in Botkins. Botkins took a 23-8 lead by the end of the first quarter and used a 27-7 scoring advantage in the second to push the lead to 50-15 by halftime. Zane Paul led Botkins with 25 points while Jaydon Wendel scored 15. Jayden Priddy-Powell scored 14 and Jacob Pleiman added 11. 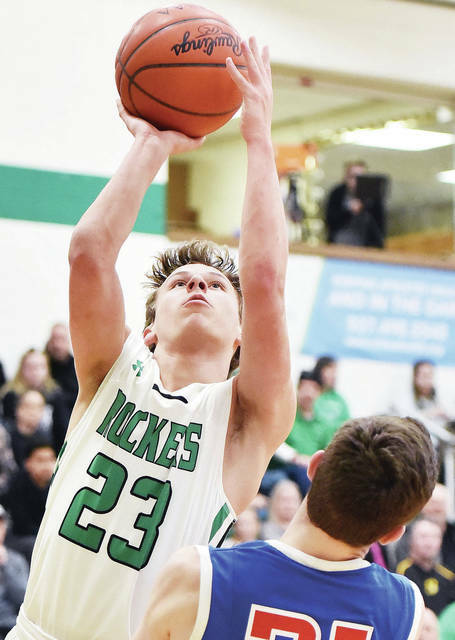 Russia took control early and cruised to a nonconference win on Saturday in Delphos. The Raiders led 14-4 at the end of the first quarter but Jefferson cut the lead to 25-20 at halftime. Russia led 37-33 heading into the fourth and closed out the win with a 15-9 scoring advantage in the fourth. Daniel Kearns led Russia with 18 points while Jordan York scored 12. The Cavaliers were no match for the Tigers’ tough defense in a nonconference game on Saturday in Jackson Center. Jackson Center built an 11-4 lead by the end of the first quarter and led 30-6 at halftime. The Tigers finished with a 10-2 scoring advantage in the third and an 11-6 advantage in the fourth. Aidan Reichert led Jackson Center with 19 points while Trent Platfoot added eight. Luke Frantz led Lehman with eight points. The Wildcats couldn’t hold onto a first-half lead and lost a home nonconference game on Saturday. Houston led 12-11 at the end of the first quarter and 24-22 at halftime. The Blackhawks took a 36-29 lead by the end of the third and held on from there. John Leist led the Wildcats with 15 points while Jairon Douglas scored 10. After a 9-9 tie at the end of the first, Minster used a 14-7 scoring advantage in the second to take control for good in a nonconference game on Saturday in St. Marys. Jarod Schulze led the Wildcats with 20 points and had six rebounds. Mike Ketner scored 11 points and Cody Frericks had eight points and brought down a team-high nine rebounds. Minster shot 20 for 51 (39.2 percent) from the field and outrebounded St. Marys 34-21. After a slow start, New Bremen pulled away in the second half to earn a nonconference win on Saturday. Fort Jennings led 7-4 at the end of the first quarter but the Cardinals used an 11-7 scoring advantage in the second to take a one-point halftime lead. New Bremen used a 15-2 scoring advantage in the third and a 17-10 advantage in the fourth to close out the win. Bryce Blickle led New Bremen with 15 points while Mitchell Hays added eight. After a slow start, Riverside dominated the second half and cruised to a nonconference win on Saturday. The Pirates led 6-4 at the end of the first quarter but didn’t score in the second and trailed 12-6 at halftime. They rallied in the second half with a 13-5 scoring advantage in the third and an 18-10 advantage in the fourth. 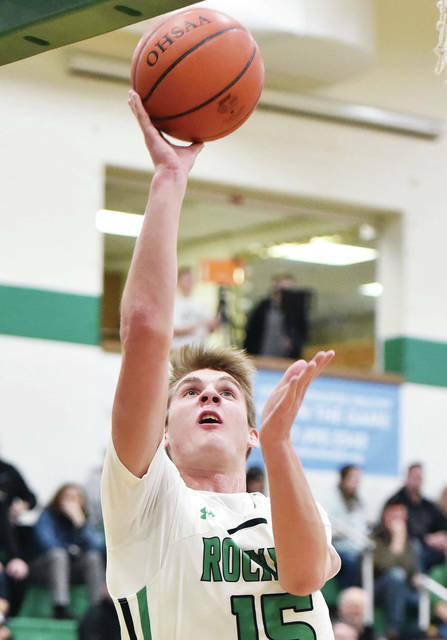 “Tonight was another game where our offense took a while to get going and we had to rely on our defense to keep us close,” Riverside coach Seth Bodenmiller said. “Fortunately shots started falling in the third quarter and we were able to take control of the second half. 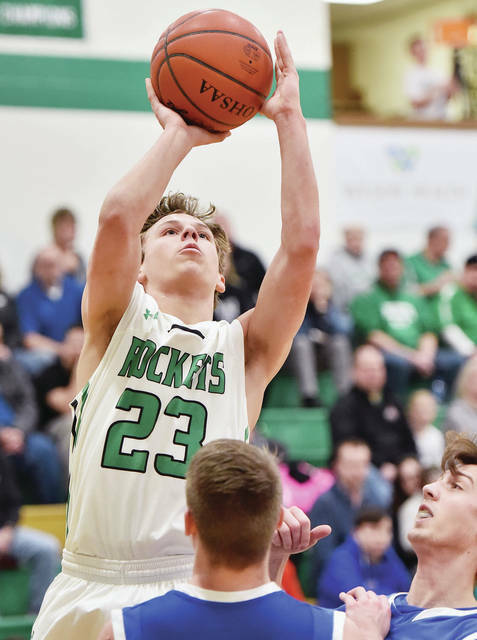 Kyle Knight led Riverside with 11 points while Wade Auflick scored nine and Kaden Burk added eight. The Pirates shot 14 for 43 (32.6 percent) from the floor and outrebounded the Jets 32-24. 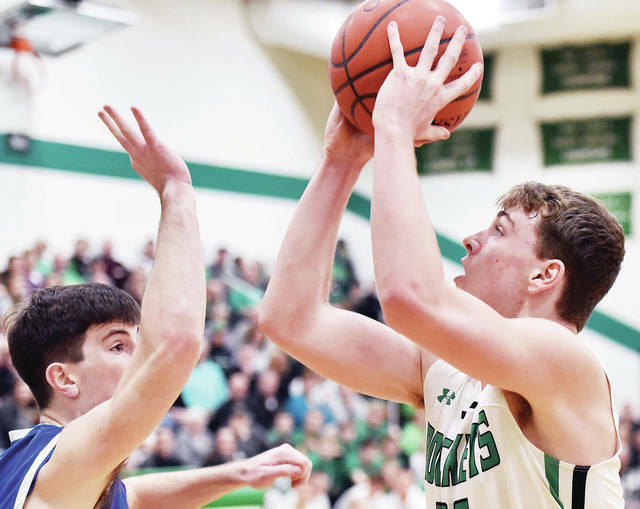 But, either way, the most important thing for the Cavaliers is that they celebrated senior day with a nonconference win over Bellefontaine on Saturday. Monnin hit a jumper with 7:00 to go and Edwards hit four straight free throws to close the deficit to 32-31 with 5:52 remaining. After that, Lehman hit 7-of-8 free throws down the stretch to seal the win. McFarland had 12 points and three steals to lead a balanced attack. 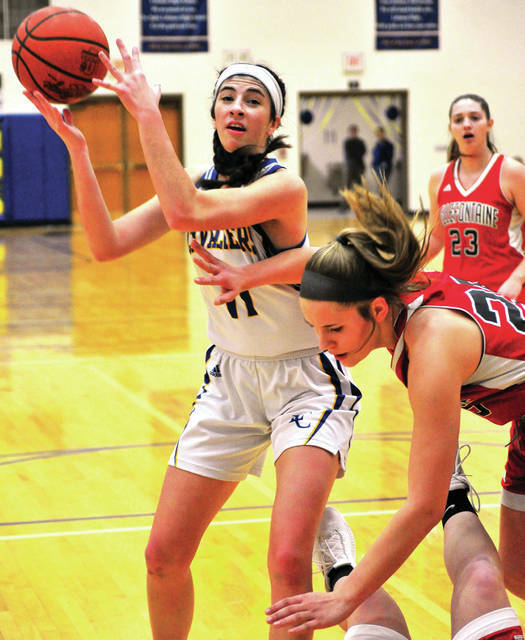 Monnin had eight points, four rebounds and three steals, while Cianciolo also scored eight points. Lehman was 15-of-45 from the floor for 33 percent and 11-of-16 from the line for 69 percent. Bellefontaine was 11-of-38 from the floor for 29 percent and 5-of-21 from the line for 24 percent. 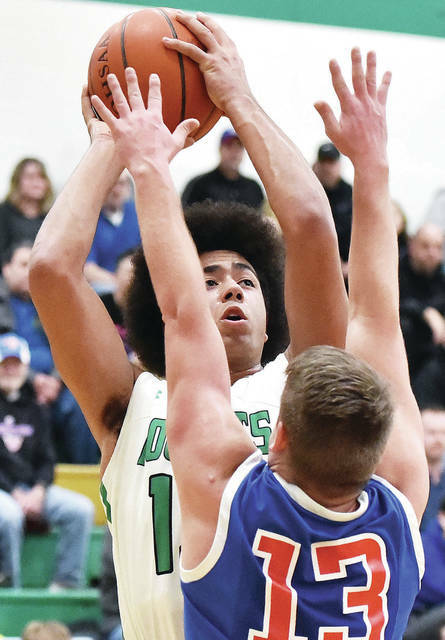 The Green Wave used a 24-2 scoring advantage in the second quarter to run away from Sidney in a Greater Western Ohio Conference American North Division game on Saturday. It was the final regular season game for the Yellow Jackets, who were winless. Emma Wiford and Samantha Reynolds each scored six points for Sidney. The Yellow Jackets shot 10 for 34 (29.4 percent) from the floor and committed 28 turnovers. Allen East outscored the Trojans 13-6 in the fourth quarter to rally and earn a nonconference win on Saturday. Allen East built a 9-2 lead by the end of the first quarter and led 17-10 at halftime. The Trojans took the lead with an 18-6 scoring advantage in the third only to see it slip away in the fourth. Makenna Maurer and Carmen Heuker each led Botkins with nine points. Versailles closed out regular season with a dominating win over Jackson Center. Jackson Center statistics were not reported. Minster ran away in the second half to a big win in a nonconference showdown on Saturday in Dayton. Carroll was ranked No. 1 in Division II in the state Associated Press poll entering the game while Minster was ranked No. 2 in Div. IV. The Wildcats led 14-10 at the end of the first quarter and 24-18 at halftime and used a 15-9 scoring advantage in the third and 11-8 advantage in the fourth to put it away. Ivy Wolf led the Wildcats with 12 pints while Courtney Prenger added 11 and Demaris Wolf scored nine. Riverside dominated from the beginning in a big nonconference win over Ansonia on Saturday. The Pirates led 13-2, 27-15, 37-33 at the quarter breaks. Dana Jones led Riverside with 18 points. Shelby Giles scored 13 points, Kalin Kreglow had nine points and 15 rebounds and Lauryn Sanford scored eight points. The Pirates shot 22 for 55 (40 percent) from the floor and outrebounded Ansonia 28-21. “The girls had a great start in today’s game,” Riverside coach Bryce Hodge said. “We had a rough second and third quarter defensively and had some starters in foul trouble. Thankfully we were able to overcome that adversity and close out the game with the win. Anna’s Bart Bixler and Greenview’s David Lehotay struggle for ball control at Anna Saturday. Anna’s Griffin Doseck shoots against Greenview at Anna Saturday. Anna’s Bart Bixler shoots over Greenview’s David Lehotay at Anna Saturday. Anna’s Kamren Steward is double teamed by Greenview’s Jack Nix and Brayden Roseman at Anna Saturday. Anna’s Carter Elliott passes as Greenview’s David Lehotay at Anna Saturday. Anna’s Justin Murray shoots as Greenview’s Collin Wilson defends at Anna Saturday. Anna’s Kamren Steward shoots as Greenview’s Ian Tamplin defends at Anna Saturday.